The uRaman Ci is a complete Raman Micro-Spectroscopy System that comes with the Nikon Ci-L research grade upright microscope. The uRaman-Ci is a complete Raman Micro-Spectroscopy System that consists of the uRaman module being integrated with the Nikon Ci-L research grade upright microscope. 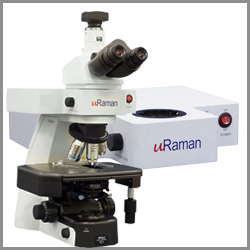 In addition to Raman and bright field microscopy, the uRaman-Ci can also be equipped with other multimodality imaging capabilities such as reflected bright field, dark field, DIC, polarization and fluorescence imaging. We also have a full range of Nikon Objective Lens and accessories such as cuvette holder for measuring liquid samples for you to choose from. uRaman-Ci can also be equipped with a XY motorized stage and uSoft Map software for Raman chemical mapping. uRaman-Ci can also be equipped with a XY motorized stage and uSoft Map software for Raman chemical mapping.